Verse Summary of the Perfection of Wisdom (Skt. Prajñāpāramitāratnaguṇasañcayagāthā; Tib. འཕགས་པ་ཤེས་རབ་ཀྱི་ཕ་རོལ་ཏུ་ཕྱིན་པ་སྡུད་པ་ཚིགས་སུ་བཅད་པ་, pakpa sherab kyi parol tu chinpa düpa tsik su chepa, Wyl. 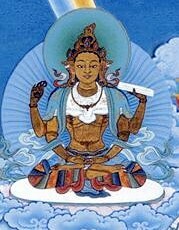 'phags pa shes rab kyi pha rol tu phyin pa sdud pa tshigs su bcad pa) is a verse summary of the Perfection of Wisdom Sutra in Eight Thousand Lines. In Tibetan it is often referred to simply as 'the summary' (Wyl. sdud pa) and is frequently cited. Like the prose 8,000 line text, it consists of 32 chapters. ↑ Chapter 3, verse 8. This page was last edited on 25 March 2018, at 02:15.